Amazon GuardDuty is an AWS threat detection service that helps protect your AWS accounts and workloads by continuously monitoring them for malicious and unauthorized behavior. 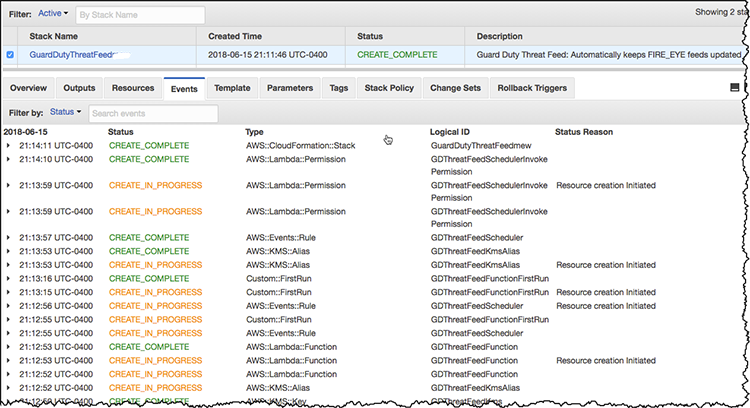 You can enable Amazon GuardDuty through the AWS Management Console with one click. It analyzes billions of events across your AWS accounts and uses machine learning to detect anomalies in account and workload activity. Then it references integrated threat intelligence feeds to identify suspected attackers. Within an AWS region, GuardDuty processes data from AWS CloudTrail Logs, Amazon Virtual Private Cloud (VPC) Flow Logs, and Domain Name System (DNS) Logs. All log data is encrypted in transit. GuardDuty extracts various fields from the logs for profiling and anomaly detection and then discards the logs. GuardDuty’s threat intelligence findings are based on ingested threat feeds from AWS threat intelligence and from third-party vendors CrowdStrike and Proofpoint. An Amazon CloudWatch Event that periodically invokes an AWS Lambda function. By default, CloudWatch will invoke the function every six days, but you can alter this if you’d like. An AWS Systems Manager Parameter Store that securely stores the public and private keys that you provide. These keys are required to download the threat feeds. 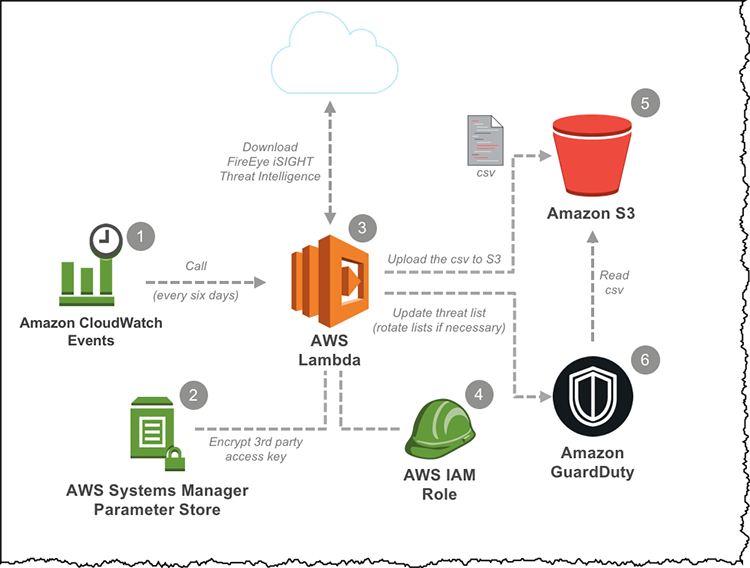 An AWS Lambda function that consists of a script that programmatically imports a licensed FireEye iSIGHT Threat Intelligence feed into Amazon GuardDuty. GuardDuty, to list, create, obtain, and update threat lists. CloudWatch Logs, to monitor, store, and access log files generated by AWS Lambda. Amazon S3, to upload threat lists on Amazon S3 and ingest them to GuardDuty. An Amazon Simple Storage Service (S3) bucket to store your threat lists. After the solution is deployed, the bucket is retained unless you delete it manually. Amazon GuardDuty, which needs to be enabled in the same AWS region in which you want to deploy the solution. Note: It’s a security best practice to enable GuardDuty in all regions. Notes: If you’ve invited other accounts to enable GuardDuty and become associated with your AWS account (such that you can view and manage their GuardDuty findings on their behalf), please run this solution from the master account. Find more information on managing master and member GuardDuty accounts here. Executing this solution from the master account ensures that Guard Duty reports findings from all the member accounts as well, using the imported threat list. The template will launch in the US East (N. Virginia) Region. To launch the solution in a different AWS Region, use the region selector in the console navigation bar. This is because Guard Duty is a region specific service. On the Select Template page, select Next. On the Specify Details page, give your solution stack a name. Under Parameters, review the default parameters for the template and modify the values, if you’d like. Public Key <Requires input> FireEye iSIGHT Threat Intelligence public key. On the Options page, you can specify tags (key-value pairs) for the resources in your stack, if you’d like, and then select Next. On the Review page, review and confirm the settings. Be sure to select the box acknowledging that the template will create AWS Identity and Access Management (IAM) resources with custom names. To deploy the stack, select Create. The Lambda function that updates your GuardDuty threat lists is invoked right after you provision the solution. It’s also set to run periodically to keep your environment updated. However, in scenarios that require faster updates to your threat intelligence lists, such as the discovery of a new Zero Day vulnerability, you can manually run the Lambda function to avoid waiting until the scheduled update event. To manually run the Lambda function, follow the steps described here to create and ingest the newly downloaded threat feeds into Amazon GuardDuty. We’ve described how to deploy an automated solution that downloads the latest threat intelligence feeds you have licensed from a third-party provider such as FireEye. This solution provides a large amount of individual threat intelligence data for GuardDuty to process and report findings on. Furthermore, as newer threat feeds are published by FireEye (or the threat intelligence feed provider of your choice), they will be automatically ingested into GuardDuty. If you have feedback about this blog post, submit comments in the Comments section below. If you have questions about this blog post, start a new thread on the Amazon GuartDuty forum.